Harrison put his Silicone Engineering Kawasaki into the lead on the run through Glen Helen on the opening lap ahead of Smiths BMW's Hickman by 1.2 seconds, while Michael Dunlop settled into third on his Tyco S1000RR. 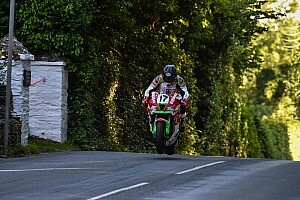 Harrison pulled four seconds through Ballaugh, though Hickman cut his deficit down to 2.3s by the time they hit Ramsey. Dunlop lost a considerable amount of time following Glen Helen, with Conor Cummins getting his Padgetts Honda into third. Harrison's lead was only 1.4s at the end of lap one, which stabilised by the time the pair came in for the first of their stops at the end of the second tour. A quick stop by the Silicone Engineering team allowed Harrison to take a five-second advantage into Glen Helen on lap three, which extended to eight at Ramsey. Hickman dug deep on lap five, and slashed Harrison's gap down to just 1.1s by setting a new outright lap record of 134.456mph in 16m50.202s. However, a slow stop for Hickman once again gifted Harrison a decent gap at Glen Helen, and he was six seconds ahead on the timesheets. A storming second half to Hickman's fifth tour meant Harrison's lead was only 1.9s as they started the final lap. Harrison found five seconds by the time they reached Ballaugh for the final time, but was only two seconds ahead by Ramsey, with Hickman then sensationally edging ahead by just 0.8s at the Bungalow section. 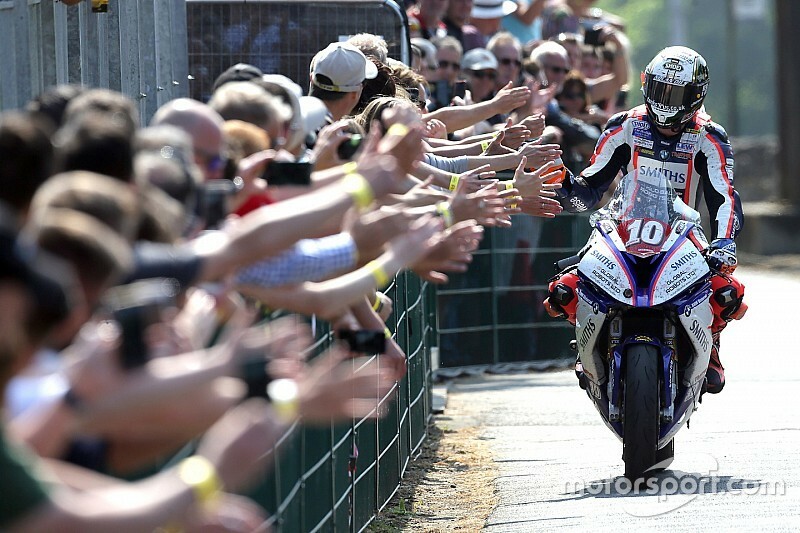 Harrison was first across the line, and set a new lap record of 134.918mph, but Hickman became the fastest-ever road racer with a 135.452mph in 16m42.778s to claim his second win of the week by two seconds. Dunlop continued to bleed time as the race unfolded, and was a distant fourth behind Cummins, who secures his second Superbike podium of the week. Josh Brookes completed the top five on the Norton, with Lee Hardy Racing's Gary Johnson 56s down the road in sixth. Saturday SBK podium finisher James Hiller pulled out with a technical issue on his JG Speedfit Kawasaki, while both Honda riders Ian Hutchinson and Lee Johnston were retirements.